The choices are dizzying here…it’s practically impossible to make a decision! Normally I can’t resist their Gold Rush Peanut Butter Sundae. That combo of Hot Fudge and Melted Peanut Butter (!!!!!) speaks to me everytime. 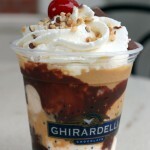 But today, just for variety’s sake, let’s take a look at another one of their Sundaes. Pick from their extensive menu of Premium Sundae options, or choose your toppings and make your own! I love their Butterscotch Sundae! Rich Ice Cream, topped with loads and loads of the most amazing Butterscotch Topping you have ever tasted! It’s sweet and salty classic goodness. 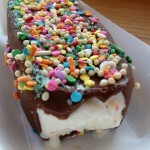 Next, we’ll head to Clarabelle’s for one of our favorite Disneyland unique treats. 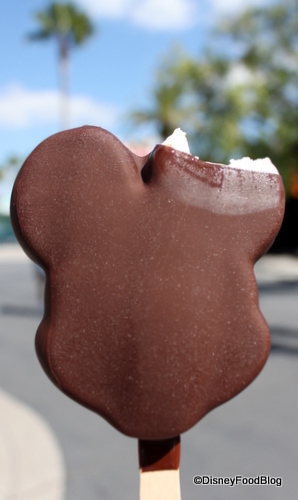 We’ve already had our Mickey Ice Cream Bar, so now it’s time for something a little different. 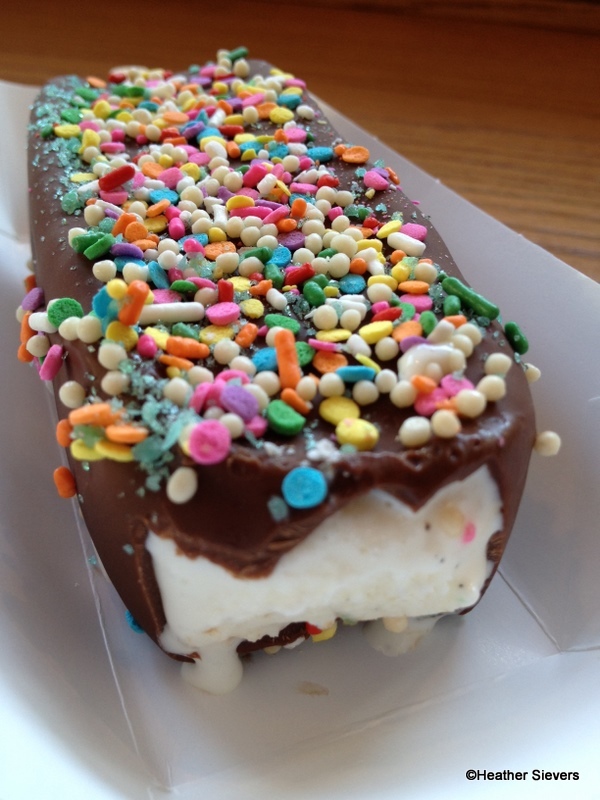 How about we try our hand at making our own with the super-personalized Hand-Dipped Ice Cream Bar at Clarabelle’s! Okay, so you don’t actually get to dip it yourself. BUT — you tell them what to dip (Vanilla, Chocolate, or Mixed Berry Sorbet), what to dip it in (Milk or Dark Chocolate), and what you’d like to sprinkle on top (Chocolate Chip Morsels, Confetti Mickeys, Blue Raspberry Bursts (like Pop Rocks! ), or Rainbow Sprinkles). If you can’t decide, go for “The Whole Herd” — all of the above! What would you pick? Today, Sorbet, Milk Chocolate, and Confetti Mickeys are speaking to me! For our final stop, we’re headed to DCA and Sally’s Cozy Cone Motel for a delicious twist on an old favorite. 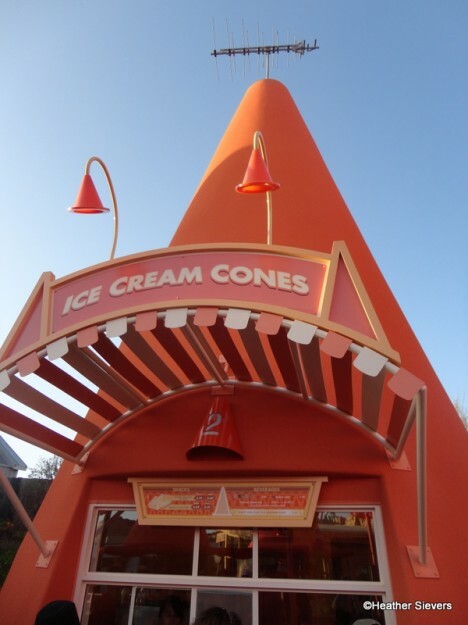 You’d expect the Cozy Cone to offer Ice Cream Cones. Right? Right! Here, you can indulge in Soft Serve Ice Cream from Cone Two! Choose Vanilla, Chocolate, or Swirled. And they’ll even dip them in Chocolate for you! Get your “Route” Beer Float from Cozy Cone #2! But for this challenge, I recommend Sally’s “Route” Beer Float! 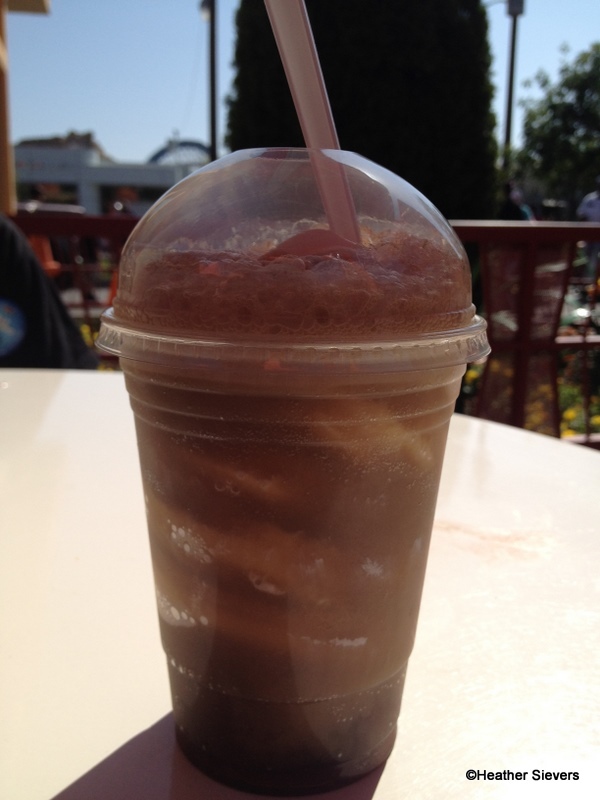 Soft Serve + Root Beer will keep you fueled up for whatever adventure lies ahead! 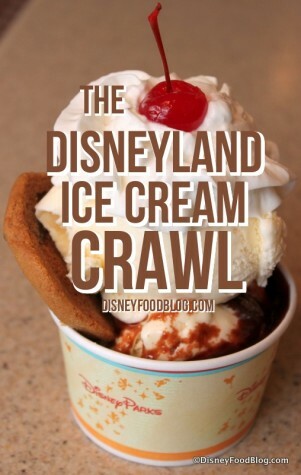 Will You Take the Disney Food Blog Disneyland Ice Cream Crawl Challenge? Well, there you have it! 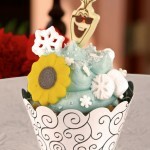 Our homage to that classic summertime treat, ice cream — Disneyland style! And now, we can’t wait to hear from you! 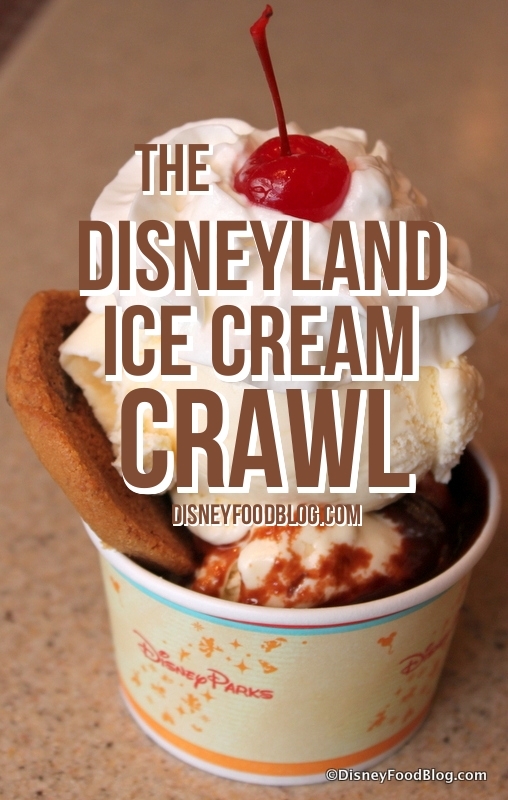 Let us know in comments below if you intend to take the Disney Food Blog Disneyland Ice Cream Crawl Challenge! « News! Booking NOW AVAILABLE for 2014 Candlelight Processional Dining Packages at Disney World! 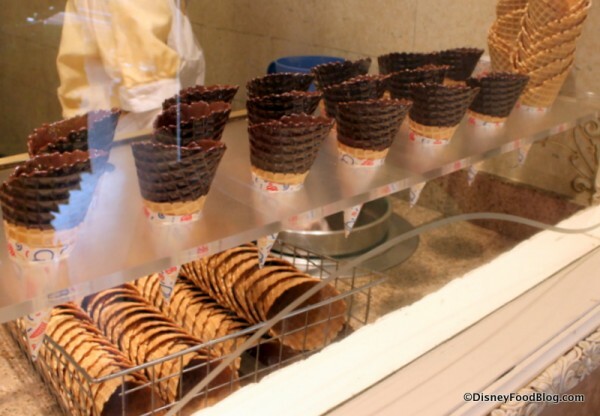 I’ve tried them all and the only two worth coming back for (to me) are the Mickey Premium bars and the Gibson Girl double scoop, waffle cone of Mocha Almond Fudge (there is a version over at CAR). You’re killing me, AJ! All look amazing. 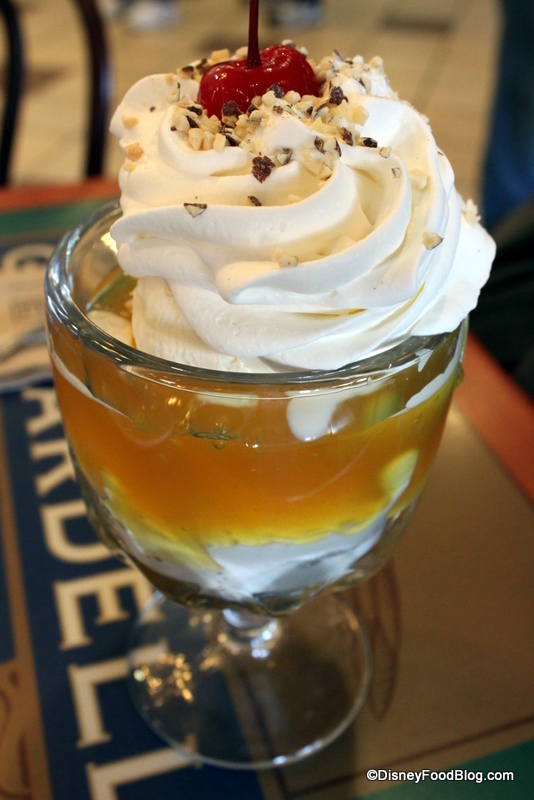 That butterscotch sundae will haunt my dreams! Thanks for posting. Challenge accepted! 53 days to the DL Half-marathon and it will be done. Pretty sure at least three of these were on my list anyway and since Napa Rose is closed (nnnooooo) I’ll just eat ice cream instead. I couldn’t do the challenge, but I sure did enjoy going thru your article! Now I want to go back thru the article and zero in on some of the related blogs. Thanks, AJ. 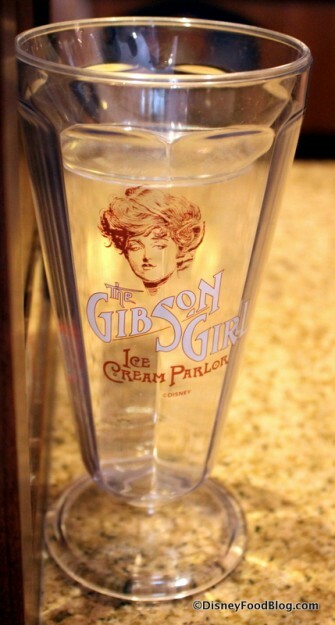 You forgot the Rootbeer Floats and Sundaes at the Golden Horseshoe. Always a good place to go when the Ice Cream Shop on Main St is packed. Hi AJ! 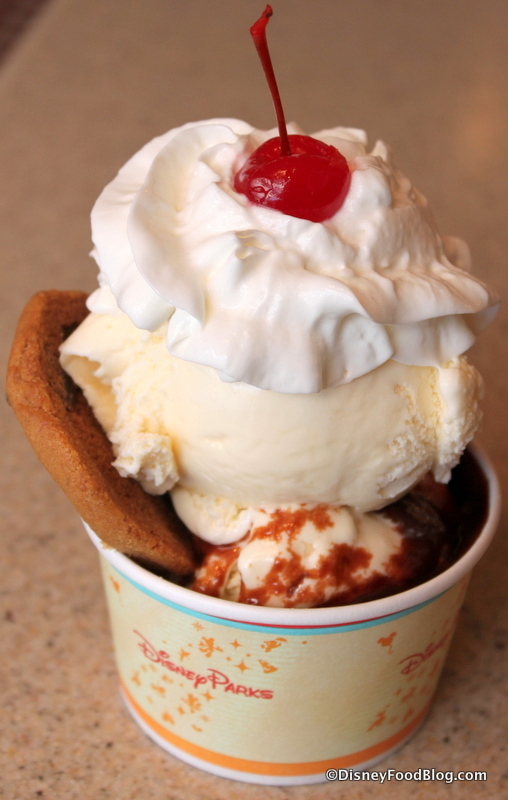 FYI- you can get the chocolate chip cookie hot fudge sundae with 3 scoops of any flavor ice cream in the Mickey Pants bowl at Clarabelle’s in California Adventure for $12! 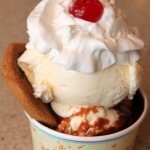 Our last cookie sundae was mocha almond fudge and cookies and cream! Route Beer Float made with soft serve ice cream… Hmmmm. 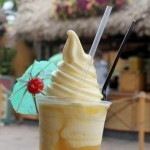 I tried making my own ice cream floats on my recent Disney Cruise, and I just could not make it work with the self-serve soft serve available on the ship. It was much runnier than it would have been with real ice cream. Am I missing something? How do they make this? i would add a soft serve twist cone from Paradise Pier. Love those!